Omaha, NE The keys to a Saturn Aura were given Thursday to an Omaha woman at a luncheon attended by over 1,400 at the Century Link Center. This is the sixth year that CARSTAR shops have partnered with the Women’s Fund of Omaha to present keys to a Recycled Rides vehicle at their fall event. Recycled Rides is a community service program of the National Auto Body Council where body shops repair and donate vehicles to families in need. State Farm® donated a vehicle to the Recycled Rides program. Danielle Goodwin, a client in the Financial Hope Collaborative at Creighton University was the recipient of the Saturn awarded at the event. A Women’s Fund of Omaha committee selected Danielle Goodwin as this year’s recipient. Danielle is a 26-year-old single mother of two young children—Durrell, 3, and Noelle, 1. Currently, Danielle’s only mode of transportation is borrowing her mother’s car. When her mom’s car is not available, Danielle has to rely on friends to give her and her children rides to and from work, school and child care. Many times Danielle is left with no choice but to walk long distances, children in tow. This has restricted Danielle’s ability to adequately provide for her family, often leaving her to buy only the groceries she can carry and limiting her education to online courses. Danielle was nominated by the Financial Hope Collaborative program, housed in Creighton’s Heider College of Business. The Financial Hope Collaborative has helped Danielle by teaching her financial self-sufficiency. In the past six months, Danielle has met regularly with her financial coach to develop goals and create accountability. During this time, Danielle has paid down her debt and built an emergency fund. In paying down her debts, she became eligible for Section 8 housing and moved into her own home in July. She has been improving her credit score by keeping up with bills and managing her cash flow. Danielle has been working as an administrative assistant for Omaha Public Schools since 2013. This fall she returned to OPS as a school and family behavior support interventionist. She is attending UNO full-time, working on her Bachelor of General Studies degree, focusing in the areas of non-profit administration, gender studies and Spanish. Her long-term goal is to pursue a master’s degree in counseling and ultimately a doctorate in Behavioral Science. Nonprofit agencies in the metro area nominated women they felt would benefit from having a vehicle. A Women’s Fund committee selected Goodwin as the recipient. Technicians at Don & Ron’s CARSTAR volunteered their skills to refurbish this vehicle. 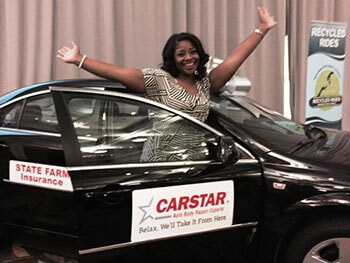 The Omaha CARSTAR locations take turns repairing and refurbishing a salvage vehicle each year for the Women’s Fund. Krajeski said many other businesses and organizations donated to make this gift possible. Companies that provided donations of parts and services include: Auto Zone, Charity Cars, EGS Marine and Auto Detail, Enterprise Rent-A-Car, Extreme Paintless Dent, House of Muffler, J.D. Casey Paint and the National Auto Body Council. This is the sixth year the Women’s Fund of Omaha has awarded keys to a vehicle at its fall luncheon. The vehicle was presented to Danielle on October 15 during the 25th Anniversary Celebration of the Women’s Fund of Omaha. This event featured Barbara Corcoran of ABC’s hit series, Shark Tank, as the keynote address. There were 1,400 people in attendance at this milestone event.